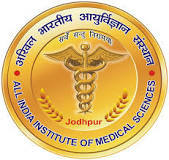 All India Institute of Medical Sciences (AIIMS), Jodhpur (Rajasthan) invites Online Applications for recruitment of Nursing Post. Eligible Candidates apply within 30 days from the date of publication of advertisement in Dainik Bhaskar / Employment news / Rojgar Samachar (10th to 16th Oct 2015 Issue). Application Fee: Rs. 500/- for General and OBC Category candidates; No fee for SC / ST / PWD / Women category candidates. The fee can be made through Online Mode using Debit Card / Credit Card / Internet Banking Only. How To Apply: The eligible and interested candidates should go through detail notification and apply ONLINE through official website of AIIMS, Jodhpur within 30 Days.